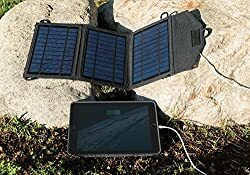 A solar charger is a very useful gadget for long backpacking trips because it allows you to easily recharge your electronic devices such as a handheld GPS device, hiking watch or a smartphone. 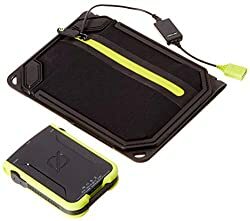 Since many backpackers rely on these devices for navigation along the trails, solar chargers have become very popular. Especially those who use smartphones for navigation on trails (check out our test of the best hiking apps) appreciate solar chargers, because no smartphone with GPS turned on constantly runs for more than a day without being recharged. Solar chargers typically consist of solar panels and a battery pack. Solar panels absorb sunlight and convert it to electricity which charges the battery pack. When the battery pack is full, you can charge other devices with it. Unlike regular power banks which get drained sooner or later, solar chargers are suitable for very long trips because they allow you to recharge the battery pack as long as you have sunlight available. 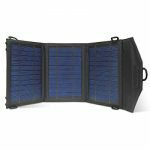 In the following we listed the best solar chargers currently available to make your buying decision a little easier. 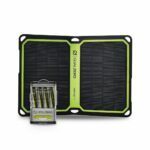 We only listed high-quality solar chargers that come for a good price and provide good durability. 1. Buying a Solar Charger – What is important? There are three types of solar chargers; panels-only, panels with integrated battery pack and panels with detachable battery pack. Such a solar charger is best for those who already have a power bank. You simply connect the solar panels to the power bank and the power bank will get charged with sunlight energy. In case that the power bank has enough capacity for your trip, you can leave the solar panels at home to reduce the weight of your pack. However, before purchasing just solar panels make sure that they are compatible with your power bank (connector type). These solar chargers are usually very compact – the solar panels and the battery pack come in one piece. Therefore, they are great for attaching to a backpack. The disadvantage is that you cannot detach the solar panels in case that you do not need them – for example on short overnight trips. Such solar chargers consist of solar panels and a detachable battery pack. In case that you don’t need the solar panels, you can leave them at home (or at a base camp) and thus reduce the weight of your pack. The larger (and heavier) the solar panel, the faster it charges the battery pack. However, keep in mind that smaller/lighter solar panels are easier to pack and carry. There are two types of solar panels; rigid and semi-flexible. Semi-flexible solar panels can be folded for easy carrying. When you need them you simply unfold them and position them towards the sun. The main advantage of semi-flexible solar panels is that they have a large surface area despite being very small when packed. The output of solar panels is measured in watts – the higher the output the more sunlight they convert to electricity per hour. Solar panels typically have attachment points, so you can attach them securely on your backpack. Keep in mind that you need sunlight for solar panels to work and therefore you should keep them out of the backpack during the day when you will probably be hiking. You typically don’t charge an electronic device directly from the solar panels because the flow of electricity fluctuates too much. Instead you charge a battery pack which you then connect your devices to for easy recharging. Battery packs differ in storage capacity and power output. The storage capacity is measured in mAh. The higher the storage capacity, the more times you can recharge your devices. However, keep in mind that a larger storage capacity also increases the weight and size of the battery pack. Most battery packs have a power output that is sufficient for charging electronic devices such as smartphones, GPS devices and GPS watches. However, battery packs can rarely charge bigger electronic devices such as laptops. 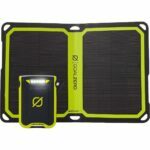 The Goal Zero Venture 30 Solar Kit features foldable solar panels and a 7800 mAh detachable battery pack to keep your smartphone, headlamp and other electronic devices powered up and ready throughout your backpacking trip. The solar panels have an output of 7 watts and can recharge the battery pack in 8 to 16 hours, depending on the weather conditions. 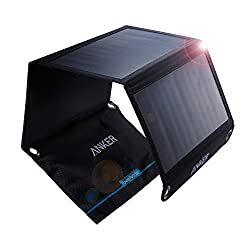 The solar panels and the battery pack are also waterproof (IPX6) and thus perfect for multiday activities such as backpacking where rain might be an issue. The battery pack is equipped with two regulated output USB ports (meaning it can charge two devices simultaneously), solar port and mini solar port. It can be also recharged from a USB source which takes approximately five hours. 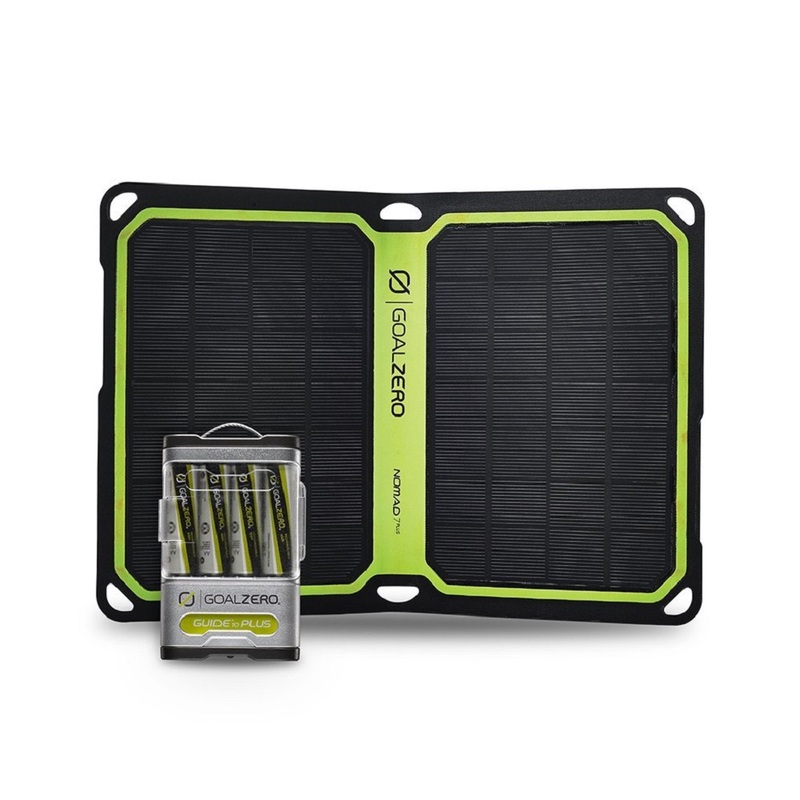 The solar panels are equipped with loops, so you can easily attach them to a backpack with carabiners or paracord. The Anker PowerPort 21W is a panels-only solar charger and thus it is a good option if you already have a battery pack/power bank. However, Anker states that the PowerPort 21W solar panels are suitable to charge electronic devices such as smartphones, headlamps etc. directly. The Anker PowerPort 21W solar charger features the PowerIQ technology which discovers and replicates your device’s original charging protocol to provide the fastest possible charging speed. However, be aware that the solar panels will not generate enough electricity to match the device’s original charging protocol in case of cloudy or rainy weather. The Anker PowerPort 21W solar charger is also super lightweight and very small when packed. It has attachment points, so you can easily attach it on a backpack. However, it is not waterproof. The Goal Zero Guide 10 solar charger includes solar panels and a detachable battery pack, similar to the Goal Zero Venture 30 Solar Kit mentioned above. However, the Guide 10 solar charger comes with a different battery pack. 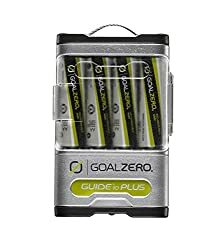 The battery pack consists of 4 AA rechargeable batteries which you can use independently or to charge other electronic devices via USB (the batteries must be in the battery pack). The possibility to use AA batteries independently is very useful because many devices (headlamps, GPS devices etc.) run on AA batteries and not all can be charged via USB. Furthermore, the battery pack also comes with an AAA adapter which allows you to recharge AAA batteries that are often used for headlamps. The battery pack is also equipped with a handy built-in flashlight. The solar charger comes with the same solar panels as the Goal Zero Venture 30 Solar Kit mentioned above. The only disadvantage of this solar charger is the relatively low storage capacity of the battery pack – it is rated at 2300 mAh. The Instapark Mercury 10W solar charger is very light and compact. 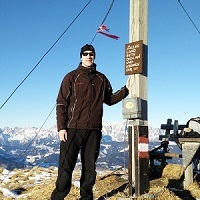 The solar charger features three solar panels and does not have a battery pack – it is a panels-only solar charger. Therefore, it is a good choice if you already have a power bank. However, the Instapark states that you can charge you electronic devices directly from the solar panels because they provide stable circuitry. Nevertheless, it will take longer to charge your electronic devices in cloudy or rainy weather. The solar panels have an output of 10 watts and can charge up to two devices simultaneously. They are also equipped with loops so that you can easily attach them to a backpack. The Powertraveller Solar Adventurer solar charger features two solar panels and an integrated battery pack with a storage capacity of 2500 mAh. The solar charger is super light and very compact. The two solar panels have an output of 3 watts while the battery pack is equipped with LED light which shows how full it is. 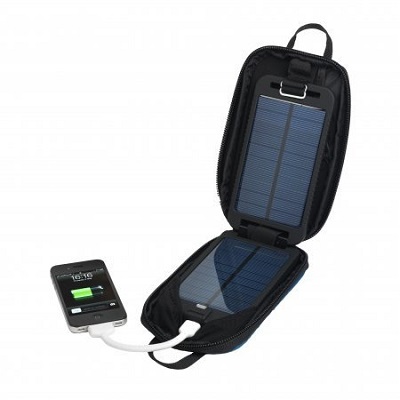 The solar charger allows you to simultaneously charge the battery pack and other electronic devices. It also features the MPPT (Maximum Power Point Tracker) technology which increases the efficiency of solar panels in cloudy weather. The solar charger is equipped with attachment points, so you can easily attach it on a backpack. Powertraveller Solarmonkey Adventurer Portable Solar Charger With a 2500 mAh Internal Battery for iPhones, iPads, iPods, mobile phones e-readers, etc.